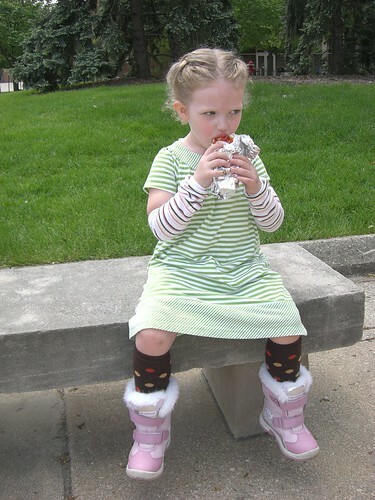 Two pairs of mismatched babylegs with a summer dress and snowboots on a warm day in May? *sigh* I know I need help. I’ll tell you all my deepest darkest cleaning secrets. *sigh* I’m so picky about my pancakes. BLOODY LEG PHOTO ANSWERS COMING TOMORROW! PROMISE! Q refused to change her pajamas this morning, so she had them on, the spiderman crocs she stole from her brother, and a pink peacoat. So, it’s all good! I had to stare at that photo for a good minute to figure out where the second pair of babylegs were. Also? If you recorded yourself cleaning to a timer (and better yet, set it to Benny Hill music), that video would become viral in moments. Seriously. Didn’t I see you wearing that exact same outfit in New York? I want to eat carbs for a cause! What a wonderful thing. You are awesome. Moosh = too precious for words. I would be afraid to take pics of my corners, lol! That is the cutest kid ever, snowboots or no. OMG – that is the cutest picture. LOVE the outfit! Awesome! Have fun with the pancaking! Pancakes and pledge! My idea of heaven! Just commenting because I think you rock and because I posted about pancakes on Monday. She is so pretty, Casey! How cool you got to do all those other things. Awesome! I can’t wait until Tyler can pick out his own clothes. I just realized that you weren’t in my blog reader… whoops. Fixed now. I KNEW that’s what it was! YAY! Love that you’re doing it!! Can’t wait to see your stuff and BusyDad’s. So, I had no idea who Trish Suhr was until I clicked on the link and OH MY HAT IT’S THE CLEAN HOUSE LADY! holy crap! she is getting big! Keras last blog post..i know it’s old, but i love it. happy friday. I read your bit about cleaning for pledge. I have a theory that when I’m rich I will have less stuff. During MedSchool and residency we were too poor to replace anything so everything was saved. I’m hoping it won’t be too long before I can throw away half of my clothes (DI) and know that when the ones I keep wear out I can replace them and I don’t need to wear stuff I’ve hauled around for 12 year. Same things with crafty stuff – I won’t have to save all the scraps because I can just buy new ones when I need it. Or maybe Cody and I just got the genetic pack-rat gene. The worst part is my hubby has it too. . .